Never did I imagine that three of our #MTtalk team would lose our fathers within six months. Michèle, who you know as @MicheleDD_MT, lost her father in November last year. Then in February of this year, Midgie, who you know as @Midgie_MT, lost her father. My father passed away at the end of May this year. Even though we’re a virtual team, we’ve known each other for a long time. The support we all got from one another while experiencing these major life events was priceless. We never had to worry about our Mind Tools work because our other team members all stepped in to help. No one ever pressured anybody into thinking they “should get over it.” We only experienced support and encouragement from all. Unfortunately, I also learned that not everybody on all teams is as supportive and understanding as my Mind Tools colleagues. A week before my father was diagnosed, I was chosen as chairperson of a professional organization in my region. Two months later, my father was deteriorating fast and I had to prioritize my time differently. Because I had to spend more and more time with my parents out of town, I resigned as chairperson. I offered to stay on as a regional committee member so that I could still help, but without them depending on my leadership. The response I got was divided, unlike my experience at Mind Tools. Most board members were supportive, but an email from one of them left me reeling. This person told me how all of the members had made personal sacrifices for the organization. He continued telling me of his very big personal time sacrifice and that it meant a seven- or eight-month delay in his doctoral studies. Was I supposed to sacrifice the precious last days with my dad because this person had sacrificed study time? I had no words. During our Twitter chat on Friday, we discussed, “Major Life Events: Impact on the Workplace.” By sharing their thoughts and views, participants from around the world helped to make this an insightful conversation. Question 1: What do you consider to be a major life event? @_simplycreate_: Something that positively or negatively disrupts and impacts the journey and path you’re currently on. @JobGJoe: Any major change or loss. Sometimes even minor disruptions can throw certain people off balance. Resilience is key. Question 2: In what ways have you seen or experienced at work the impact of a major life event? @MolinaCareers: Low productivity and issues in communication. @ZalkaB: For me personally, it made me re-think my priorities and see the world and work from another perspective; examined my values. Question 3: “You should be able to separate your personal life from work.” Agree/disagree? Why? Most of our participants disagreed and @MikeBarzacchini reminded us that it works both ways: Work sometimes influences your personal life, and life events sometimes influence your work life. @ellyambrose: This is not always possible. You are one person so it’s natural that your personal life and professional life will influence each other. @BrainBlenderTec: Work life is just an extension of who you are. It’s about lifestyle nowadays. Question 4: What systems, attitudes or behaviors at work can make a major life event even harder to deal with? @EdNavigation: Lack of family-friendly culture, lack of flexible work options, lack of management training about diverse employee needs. @ShereesePubHlth: In the work environment, policies ARE usually in place for life events but when leaders lack emotional intelligence, the system fails. Question 5: In what ways do employers sometimes discriminate against employees caring for sick or aging family members? Unfortunately, discrimination against caregivers seems to be more prevalent than we think. @danceswithlyons: Not having a policy on how to use days needed for time off. Caring is never a “vacation” but often booked as such. @GThakore: Pressure tactics, playing with emotions and worst is they will remind you about your mistakes and failures. Question 6: How can we recognize when someone at work is having difficulty coping? What are the signs? @CaptRajeshwar: They talk less, don’t smile, don’t participate in events, look worried. Jittery, sudden anger, less performance, stony eyes. Stick to seat. @harrisonia: When you notice that someone loses his/her normal attention to detail, this can be an early warning sign. Question 7: What is an organization’s role in supporting employees experiencing a major life event? @hopegovind: An organization needs to treat employees as family members: with love and compassion. @PG_pmp: Most important is organizational culture where people respect and value each other, because policies are almost the same in all organizations. Question 8: What action from a colleague did you appreciate most while dealing with a major life event? While responses ranged from getting flowers to just being there for someone, the common theme for this question was listening. @MikeBarzacchini: Someone being fully present and taking the time to listen. Then helping me find perspective with no judgment. @NootsCaboots: I was worried about asking for time off so when a colleague insisted that I took a day to recover, it really helped. Question 9: What can you do to protect your health while coping with a major life event and working? @KrisGiere: I had to learn how to forgive myself for not doing it all on my own. Most major events require support; it’s not weakness. Kris also reminded us even positive events that bring about major changes can tax our bodies, emotions and energy. Question 10: If you could recommend one coping strategy, what would it be? @TwisterKW: Don’t look too far ahead. Start with the next 60 seconds and increase at your own pace. Manageable moments. Be kind. @AppPsych: Make time to talk to someone who really listens and who you feel comfortable with. In doing so you can reflect, learn and move forward. Major life events sometimes force you to have the tough conversations you’ve avoided for a long time. What’s your number one reason for avoiding a tough conversation? Cast your vote in our Twitter poll. It doesn’t matter how much we hear about the importance of good communication in the workplace and at home, we sometimes choose not to have difficult conversations. In our next #MTtalk on Friday December 9, 2016, we’ll be talking about, “Being Brave: Having Tough Conversations.” Join us at 1pm EST/6pm GMT. To participate in our chat about having tough conversations, type #MTtalk in the Twitter search function. Then, click on “All Tweets” and you’ll be able to follow the live chat feed. 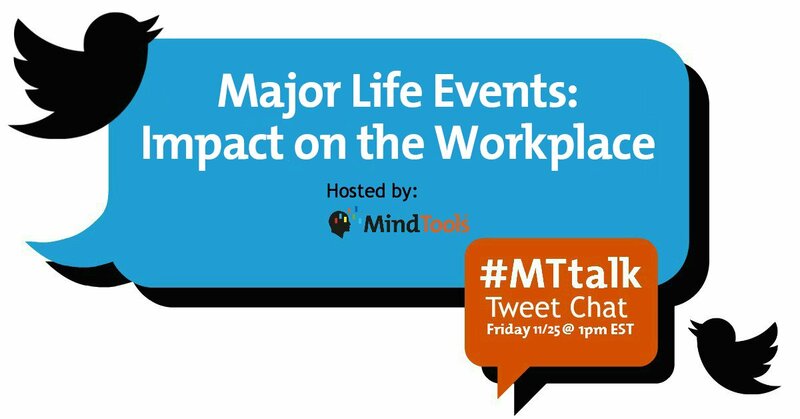 To join the conversation, simply include #MTtalk in your tweet and it will show up in the chat feed. Thanks Caterina, I’m glad you found it helpful.